I am under consideration for Palau in Micronesia. I had to google it in order to see where it was on a map. I’m nervous about going away. Any advice you can give since you’re there? Hi Brooke! It”s great to here from you. Traveling to Micronesia was my first time going out of the country to live on my own. I was extremely skeptical and also had know idea that these islands existed. However, my journey so far has been great! After the three month training in the state of Pohnpei I was assigned to the state of Kosrae. It is much more modern here than I would have ever guessed. The Protestant church had a very big impact on the way of life here over the past few 100 years. All of the Peace Corps. 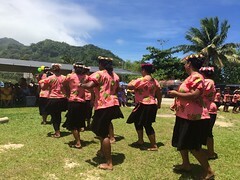 in Kosrae have wifi in their homes and sometimes cable television.Many girls are less conservative in their dress and wear shots and tank tops. All of our schools are also walking distance. The outcome for me was not as scary as the worst cast scenario. Also, during your placement interview in training, the staff will ask you if you prefer to go to an outer or main island. The island life if very chill and exotic. Let me know if you have any other questions! I hope your interview goes well!